I found a Bob Ross Video to do, finally. They are so hard to find. I have decided to invest in some liquid white to wet the canvas and will get some oil paints soon. Keep an eye out for my creation. 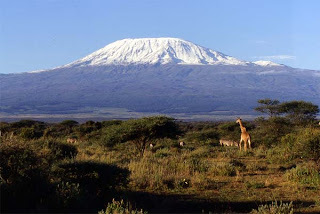 If you want to help make a difference, please can you follow this blog using your Facebook, Twitter or Google/Blogger (Youtube) Account and help join in the support for the girls climbing Kilimanjaro in 2011. We had our Naomi House posters up and had told him all the money raised was going to charity so he knew what we were about. Anyway, later on, Linz (my other half) was wandering around and found same round chap on his own stall selling the DVDs he'd just bought from us for £1 each!!!! The bloomin' cheek of it! Well, Linz came back and mentioned it and Justine marched straight over and ripped a strip off him! Good for her, some people are unbelievable! All very funny stuff and all for a good cause. There is no way I can tell what these look like from those silly little swatches. Newsflash, they show pctures of whole rooms decorated in the paper and also you can order FREE samples. Sold! I love this site. 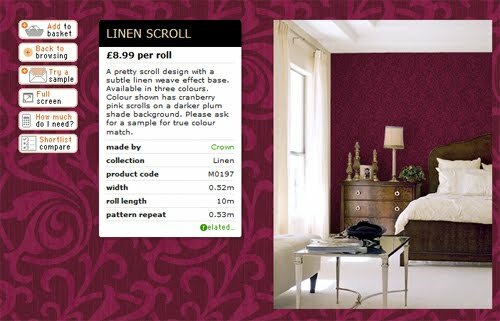 So, now we have more than 2 wallpapers to choose form for the 2 bedrooms, we want to move on to the living room. Our furniture is black and red. 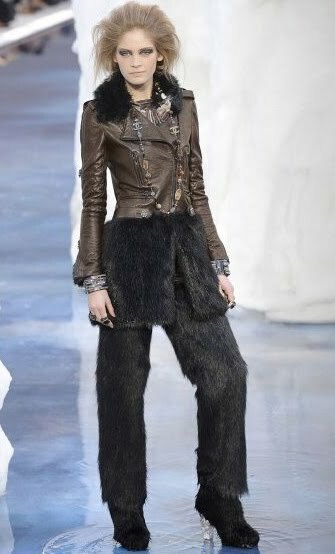 Yes, eighties I know, but in a stylish and funky way. Let's see what crops up here then. We love the ones wih red flowers. On a whole wall, they look incredible! I have never been so excited to conjure up images of wallpaper pasting tables, mess everywhere and a square scalf around my head and dungarees below whilst creating our first French home together. I do imagine a certain Mr T will be participating, no dount with his head in a bucket of paste or paint! After beginning a search for a new home in France, I have discovered the French do not do kitchens. What the hell is that about? I mean who can chop onions, cook a full English breakfast or even attempt a roast dinner, or even steak frites for that matter in a kitchen that has just a sink. Yes, just a sink. 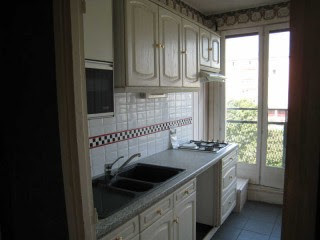 However, on a better note for just 520€ you can get a rather large appartment in Rouen with 2 bedrooms and alot of nice traditional French windows. I have found a place that I could really see myself living in. It has, wait for it. 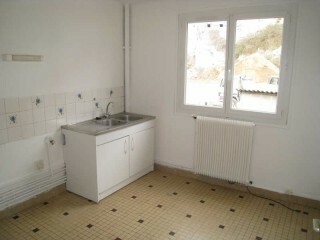 A KITCHEN. A real one. I never knew seeing a fully equiped kitchen could make me shout, "Love it". Now, on to some more positive things about French places. 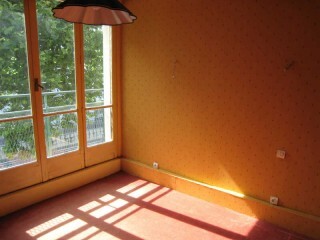 They have lots of long, windows that make the rooms very light. Something we seem to not do in England. 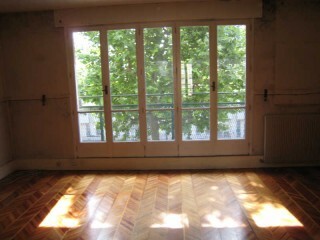 If you see a French window in England you yell "Love it" as apposed to the taken for granted kitchens. Alot of the places have these gorgeous windows and it just makes me smile to imagine having my croissant and coffee on a summer morning somewhere like this. 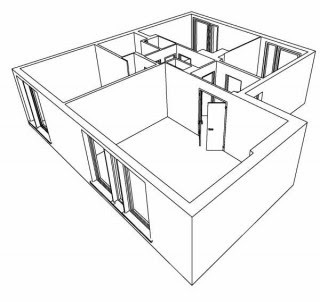 I was sold on the kitchen, no more references to kitchens, I swear, the wonderful séjour (living room) and then proceeded to the bedrooms. Quelle horreur!! Oh my heavenly days. Time to visit homebase get some paint and wallpaper samples! Speaking of which, I must do a post on gorgeous wallpapers. 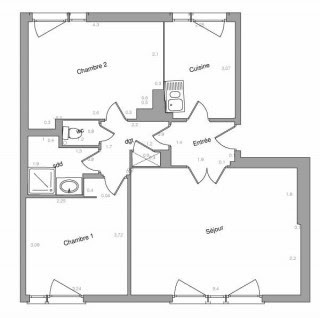 The sizes of the rooms are perfect and are not putting me off this place. 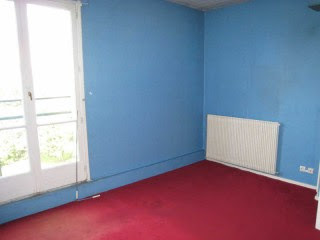 I feel happier than ever to be moving to France and I am desperate to get my hands on a few paint brushes and wallpaper paste to put up something to stamp the place as ours.One last thing, the French do provide on some listings layouts and in 3D too. This is something you never see in England. This makes it 2-1 to France. 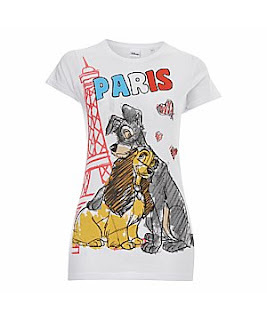 Check out this adorable Lady and the Tramp T Shirt on sale at New Look! I ordered this today, smack hand! But I did also find a gorgeous top for someone else which I will not post as it is a surprise!